Properties in Mariposa County average 4.6 out of 5 stars. Property 1: 1893 vineyard cottage at the gateway to Yosemite. Lovely Straw Bale Home with Views of the Yosemite High Sierra! Property 5: Lovely Straw Bale Home with Views of the Yosemite High Sierra! Property 9: Great Rates! Walking Distance to Tenaya and Southern Gate! Dogs Welcome! Yosemite Mountain Escapes! Comfort while visiting Yosemite Winter Specials! Property 11: Yosemite Mountain Escapes! Comfort while visiting Yosemite Winter Specials! Property 14: Yosemite vacation rental 30 minutes from Yosemite Valley's main gate. Property 26: Yosemite’s Hitescove Hideaway! Property 27: Peaceful Yosemite Pines Retreat, HUGE YARD, POOL, SPA, PLAY AREA and PONIES! Yosemite Mountain Escapes! Comfort while visiting Yosemite Winter Specials! Spa! Property 28: Yosemite Mountain Escapes! Comfort while visiting Yosemite Winter Specials! Spa! Unwind in the Yosemite Area. Inviting, Spacious And Modern Home with Hot Tub! Property 30: Unwind in the Yosemite Area. Inviting, Spacious And Modern Home with Hot Tub! Winter Special!Cozy Cottage close to Yosemite, Beautiful Views, Hot Tub & More! Property 31: Winter Special!Cozy Cottage close to Yosemite, Beautiful Views, Hot Tub & More! Yosemite! Beautiful NEW home amidst towering pines overlooking creek.Pool table! Property 32: Yosemite! Beautiful NEW home amidst towering pines overlooking creek.Pool table! Property 35: Beautiful 'Serenity Ranch' Mins to Don Pedro Lake! Property 39: Valley Oak Bed and Breakfast, enjoy my home away from home Gateway to Yosemite. Beautiful Creekside Home in Mariposa Pines Close to Yosemite. 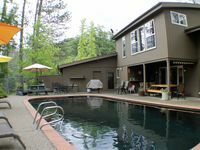 Property 40: Beautiful Creekside Home in Mariposa Pines Close to Yosemite. Beautiful house & property. Close to town & park. Family friendly. Property 44: Beautiful house & property. Close to town & park. Family friendly. Large private house close to Yosemite. In-ground Pool, Spa, and nice views. Property 46: Large private house close to Yosemite. In-ground Pool, Spa, and nice views.